English and the community functions on the basis of a variety of ethnic institutions that operate in the immigrant's own mother tongue. These include local stores and markets, churches, clubs, welfare agencies and other organizations that serve the needs of the local population. Frequently employment opportunities in occupa- tions where English is unnecessary are also available to men and women in the neighbourhood. These ethnic neighbourhoods exhibit a high degree of functional interdependence which would be severely disrupted by urban renewal schemes involving widespread clearance. The proposed extension of freeways could give rise to problems in this respect. Even the "spot clearance" schemes of a more limited kind would have more serious social and human repercussions in such areas in view of the high incidence of "doubling". 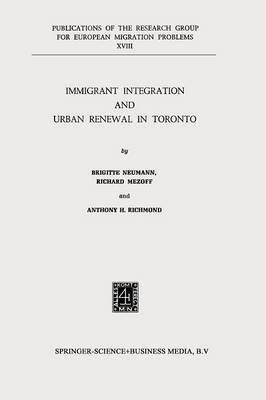 It is significant that certain planning areas in which urban renewal has already proceeded, such as the Don area including the Regent Park public housing scheme, have consisted predominantly of native-born Canadians of British origin. The experience gained in these schl~mes is not likely to be a useful guide to the probable consequen -;es of improvement and other schemes in those areas with a mt l"e heterogeneous population. An examination of the population . ::haracteristics in those areas designated for renewal in the future suggests that the social effects and human implications of these plans may be somewhat different from past experience.